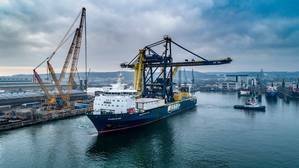 The heavy lift shipping and offshore transportation & installation contractor Jumbo Maritime has recently completed two shipments of two giant ship unloaders from Gdynia Port, Poland to Djen Djen Port in Algeria for Fagioli. The second shipment was made in February 2019. "Jumbo would like to thank to all the teams involved for the successful completion of both lifts and transportation," said a statement.